In this tutorial, we’re going to see how we can install django on windows, linux or mac platform. First of all, open https://www.djangoproject.com/. It is the official website of django. There is a ton of good information, you can also download the django from this website. But I am not recommending to download it from there. We’ll see another way to install django easily. Particularly the tutorials in that website are great if you want to get started with django with a solid foundation. But some of the students find out these tutorials little bit confusing. So we’ll provide you tutorials that we think is most relevant to you as a beginner. Now we will install django with pip instead of downloading straight from the website. pip basically allows us to take other people’s Python code and bring it into our project, so that we can use it. So django can actually be downloaded into our computer as one of these pip packages. Note: pip comes bundled automatically with Python 3. So that’s why we have to make sure that we should have Python 3 and we also need it because thats the only version that work with django 2. If you got Python 3 in your system then you also got pip installed in your system. 2. Type the command below and hit enter. Make sure you have internet connection. Now wait to install django in your system. There is no need to give any specific version of django while uninstalling it. Note: If you have both versions of Python (Python 2 and 3) installed in your system then to download the latest version of django please use pip3 instead of pip. 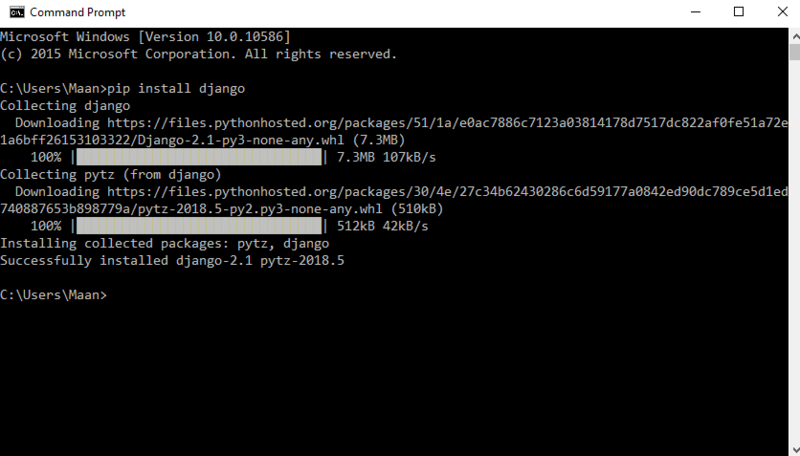 If you use pip not pip3 then it will download the compatible version for Python 2, which is django 1.11.15 currently. Let’s see screenshot of installations. If you are having any problem with any step of django installation then please comment below, we’ll reply as soon as possible.